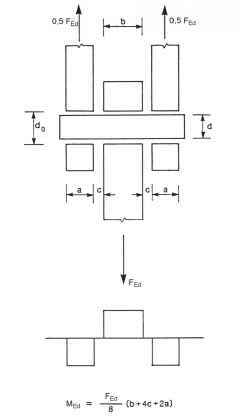 the angle between the planes in a multiplanar joint. i and j are integer subscripts used in overlap type joints, i to denote the overlapping brace member and j to denote the overlapped brace member, see Figure 1.4(c). the value of cr0,Ed excluding the stress due to the components parallel to the chord axis of the axial forces in the braces at that joint, see Figure 1.4. /.,,-, is the overlap ratio, expressed as a percentage (lov = (q/p) x 100%) as shown in figure 1.3(b). (7) Other symbols are specified in appropriate clauses when they are used. NOTE: Symbols for circular sections are given in Table 7.2. (1) The design methods given in this part of EN 1993 assume that the standard of construction is as specified in the execution standards given in 2.8 and that the construction materials and products used are those specified in EN 1993 or in the relevant material and product specifications. (1) All joints shall have a design resistance such that the structure is capable of satisfying all the basic design requirements given in this Standard and in EN 1993-1-1. (2) The partial safety factors yM for joints are given in Table 2.1.